Jay Bell sends along these photos of the ruins of Pastor Bob Smoker’s home which burned to the ground on Friday (see yesterday’s post). 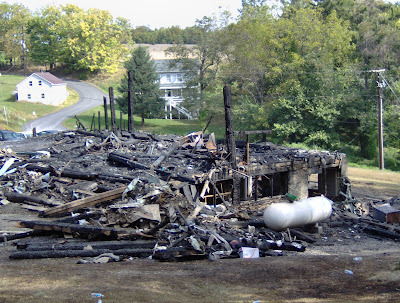 I’ve created a place on our NAF website to accept monetary donations to help Bob and Jean Smoker after this tragic fire. There is a Prayer page on the site that explains the magnitude of the loss. The URL for Prayer is http://www.gbnaf.org/prayer.html, and folks can contribute here http://www.gbnaf.org/contributions.html. There are also links from the Main page found at www.GBNAF.org. I also think dropping them a note reminding them how much we love them would be comforting too. The church address is; Susquehanna GBC, 6694 Sunrise Ave., Wrightsville, PA 17368.